Be the first to share your favorite memory, photo or story of Jacqueline. This memorial page is dedicated for family, friends and future generations to celebrate the life of their loved one. Jacqueline L. Wires passed away peacefully on October 29, 2018. Jacque married Fred A. Wires in 1959. They had one daughter, Lee Anne. Jacque graduated from Anthony Wayne High School. She earned her B.S. in education from The Ohio State University and her M.Ed. from the University of Toledo. A born teacher, she taught for 34 years before retiring in 1991. She held teaching jobs in San Antonio Texas, Perrysburg and Rossford, Ohio. Most of her time was spent teaching 5th and 6th grades at Eagle Point School in Rossford. 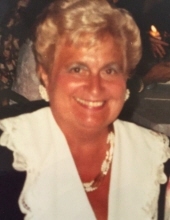 Never being one to sit still, she held leadership roles in several organizations including; Delta Kappa Gamma, Beta Sigma Phi, Delta Gamma, Lady Elks, Rossford Education Association, Wood County Retired Teachers and Ohio Retired Teachers Association. Jacque will be remembered for her quick wit, her kind and compassionate spirit, and her love of the color purple. Jacque is survived by her daughter Lee Anne (Reid) Stringer, granddaughter Abigail, sister-in-law Kate, and many treasured nieces and nephews. She was preceded in death by her parents Wilber and Leona Klatt, husband Fred, brothers-in-laws John and Ken, and sister-in-law Patricia. Jacque's funeral service will be held on Friday, November 2, 2018 at 12:00 p.m. at Peinert-Dunn Funeral Home, 7220 Dutch Rd., Waterville, OH. Pastor Matthew Lash will offiate. Interment will follow at Wakeman Cemetery. Visitation will be held Friday morning at the funeral home from 10:00 a.m. until the time of the funeral service at 12:00 p.m. In Lieu of flowers, if you would like to make a donation, the family asks that you make the donation to First Book or the Alzheimer’s Association. The family would like to thank the staff at Genesis Perrysburg Center Homestead Unit and Northwest Ohio Hospice for the compassionate care they gave to Jacque. To send flowers or a remembrance gift to the family of Jacqueline Lee Wires, please visit our Tribute Store. "Email Address" would like to share the life celebration of Jacqueline Lee Wires. Click on the "link" to go to share a favorite memory or leave a condolence message for the family.